Running towards the ultimate finish line: a world without cancer! In 2008, I lost my best friend, my dad. 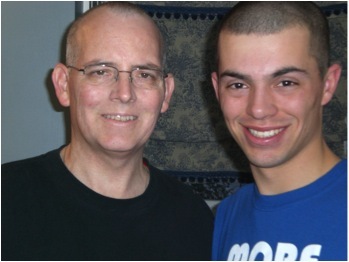 Dad fought a courageous battle against cancer for almost a year. Throughout his fight, he was treated at Dana-Farber. Dana-Farber provided Dad, and the entire family, with hope and gave him a chance. I will forever be grateful for all they did to help my father. This year, I will be running my eleventh Boston Marathon in support of Dana-Farber. It is a small token of appreciation to Dana-Farber and a way I try to honor one of my heroes. One hundred percent of every dollar raised by the DFMC team supports the Claudia Adams Barr Program in Innovative Basic Cancer Research at Dana-Farber Cancer Institute. These funds are fueling some of today's most promising basic cancer research. Thank you for your support! Together, we're headed toward the ultimate finish line: a world without cancer. In loving memory of Janet Fox Wiley. Every dollar raised helps fuel Dana-Farber Cancer Institute's mission. Together, we can conquer cancer! Contact the Running Programs staff at 617-632-1970 or DFMC@dfci.harvard.edu. Dana-Farber Cancer Institute is a 501(c)(3) organization.